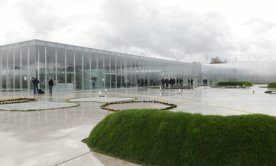 Perhaps the most famous museum of them all, the Louvre, has opened a satellite in the unlikely setting of Lens in Northern France. This shimmering glass building is to be found in what was once the heart of the Northern French coal mining region, but all that is long gone. The Lens outpost of the Louvre, the most visited museum in the world, could transform the post-industrial north, with local politicians hailing it as a miracle. The industrial heritage of the area is plain to see with a view from the galleries of the largest slag heaps in Europe, recently designated as a world heritage site. The region of Picardy is often mocked by the rest of France as being backward and a cultural desert, but this new venture could change that for good. What makes the Louvre-Lens musem interesting to the British public is its ease of access to the UK. Lens is just a short drive of about 1 hour from the ferry terminals at Calais. So for those British motorists who enjoy driving abroad this newly opened centre of cultural excellence could even be visited in a day trip. Check the prices available from P&O Ferries or DFDS Seaways, both running frequent ferries to France from Dover to Calais. The museum will be featuring a rolling programme of works normally only to be seen in the Louvre in Paris. The museum opened on December 12th 2012 with an exhibition of Renaissance art which includes Leonardo Da Vinci's newly restored The Virgin and Child with Saint Anne. This will be the first time this masterpiece has been seen outside the Paris Louvre for 200 years. The space available for temporary exhibitions is greater than that in the Louvre itself, so we can expect some fascinating shows. In addition, praise has been heaped on the architecture, with the buildings described as boats on a river delicately floating into a huddle. The only disappointment is the Louvre-Lens website which has few images, a strange ommission for an art gallery, is only in French (fair enough - how many important British websites have French versions? ), and does little to inspire.